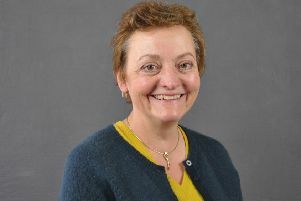 Selkirkshire Councillor and new List MSP Michelle Ballantyne has made her maiden speech at Holyrood in a debate on protecting workers’ lives. Mrs Ballantyne declared her interests and gave an insight into her early political career. She said: “Last week, as I entered the chamber for the first time, my father reminded me of the letters we had exchanged many years ago when I was complaining that my beloved NHS needed reforming or it was going to run into real difficulties. “He had written back replying that the only way I could ever really bring about change was to become a politician. “My response was polite but firm. Hell was definitely going to freeze over first. “But in 2009, my local councillor Gavin Logan saw fit to persuade me to join the Conservative Party and run for council. But Gavin may be disappointed to learn that it was in fact during the general election of 1974 that I first stood as a candidate. “I was of course just a child then ... it was the mock election at my primary school. I was the candidate for the PLP – the Prevent Litter Party, and I am delighted to report that our heart-felt campaigning won the day and presented us with the honour of implementing our promises for one year. “I learnt a valuable lesson ... making promises was easy, delivering results was the main challenge. “After a year of picking up litter and trying to convince people not to drop it in the first place, I understood that you can only get results if your promises are realistic, if everyone works together and we share the responsibility for our world. “The laws we make and the messages we send out from this chamber should be ones that support your rights and responsibilities, whether you are an employer or an employee. “They should encourage enterprise, reward endeavour and support success, because you do not protect the vulnerable in our society by penalising that success. “As a nurse, and then in management, I spent 36 years working in the NHS and the third sector. To hear Mrs Ballantyne’s whole speech, visit www.thesouthernreporter to see the video of the debate.